Joe Braven (Momoa) is a hard working man running his Canadian logging business while trying to provide for his family and take care of his dementia suffering father (Lang). When Braven Sr. takes a turn for the worse, Joe decides to take him up to their woodland cabin to talk to him about his worsening condition and how they might best provide for him in the future. Unbeknownst to the tough men of the land, a large shipment of drugs has been stashed in their forest retreat and the goons it belongs to have come a calling. Soon the Braven clan is under siege and must fight for survival against a squad of heavily armed criminals. Rough and tumble, back-to-basics action flick with a good dose of meaty drama, Braven is a blast of fresh mountain air. Stunningly shot and set in the Canadian wilderness this tough action drama delivers the old school thrills. It’s refreshing to see this type of flick still being made: an action film with characters we care about and gritty action scenes all done for real. With inventive stunt work and the harsh setting adding to the danger of the situation, stunt coordinator turned director Lin Oeding crafts an entertaining albeit brutal low-fi action film. The novel use of bows, axes and the surrounding wilderness utilised by our hero makes for some refreshingly creative action. Jason Momoa, despite his impressive physical presence, also makes for a grounded hero. While he’s more than capable of engaging in a fight and thinks fast on his feet to creatively kill the bad guys, he never seems like an unstoppable killing machine no-one can touch: much more of a regular guy who is running on pure adrenaline and desperation to save his family which gives urgency and grit to the action. 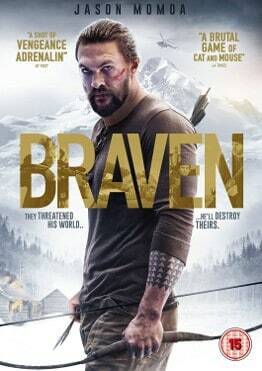 In addition, he’s not the lone super-duper hero, as the whole Braven family gets in on the fight which ups the stakes of the action and gives it a unique slant: the title referring to the whole clan rather than just Joe himself. The flick wisely builds to the action as we get to know the family first and the various issues they’re dealing with, which in turn adds another element of danger to the unfolding action. Sure the bad guys are somewhat action movie 101 rent-a-goon, though Garret Dillahunt still makes for a deliciously evil and worthy adversary, and plot contrivance and coincidence rear their ugly heads on occasion but if you like your action films down and dirty with some emotional heft, then Braven is an adrenaline soaked treat. Braven is released on DVD and Blu Ray by 101 Films in the UK on April 30th and features a couple of short but sweet featurettes about the making of film.